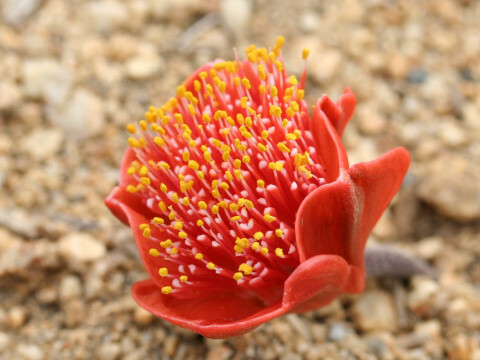 Blood flower (Haemanthus coccineus) belongs to the Liliaceae (the Lily family). It is an evergreen herb that is native to South Africa. This herb grows in winter rainfall areas, mainly coastal scrags and rocky places. It has a globose bulb and grows up to a height of 20 cm. The leaves are 2-3, thick and fleshy. 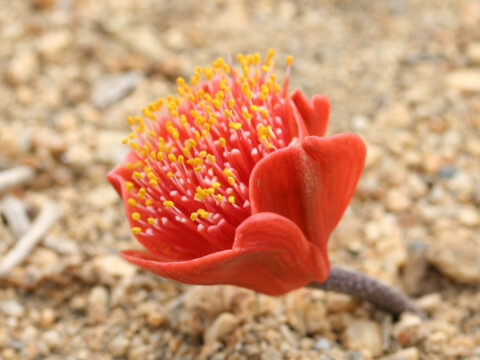 The flowering stalk is borne and paintbrush-like vermilion red flowers bloom before foliation from February to April. The bright red bracts surround flowers.